From time ago I've been thinking about how to make a good illumination system for the layout. The current illumination system is good for a garage, just fluorescent tubes, but very bad for the layout. Even for some kind of works I need to use a portable light. But I don't want just a good illumination to work on the layout and make beautiful photos, I also want to create weather effects, like sunrises, sunsets and storms. 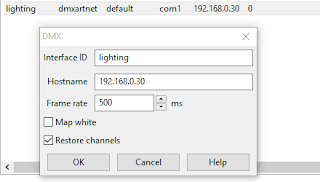 Philips HUE consist in a a group of lights connected by wi-fi to some kind of router or concentrator that you can manage to set the intensity and color of each light individually. It's a very good solution because if you are not using Rocrail you can still manage the lighting system with the Philips application. But the bad news are the price of the lamps, too expensive in my opinion and restricted to Philips lamp models. Next compatible system is called DMX. 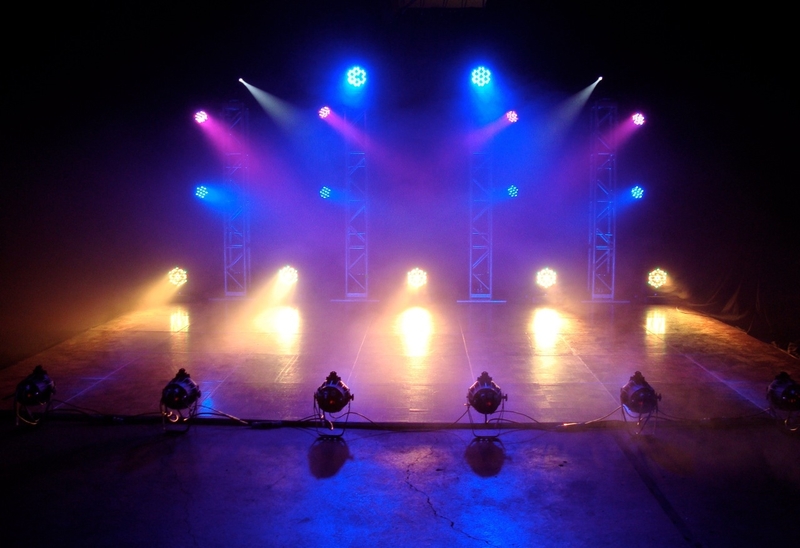 I made further investigations and learned it is the most standard protocol for managing lighting systems like those used in theaters, concerts and discos. 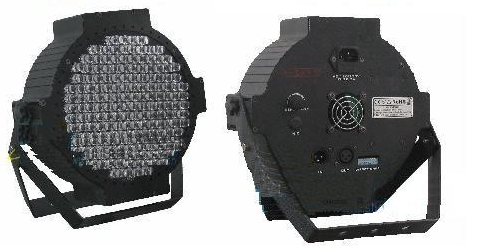 According wikipedia: "DMX512 (Digital Multiplex) is a standard for digital communication networks that are commonly used to control stage lighting and effects." There is a huge range of spot lights, flood lamps, lasers, stroboscopic lamps, motorized led beamers, ..... but of course we are talking about professional systems, what means each light is expensive because it implements an special DMX connector and protocol to receive the orders. 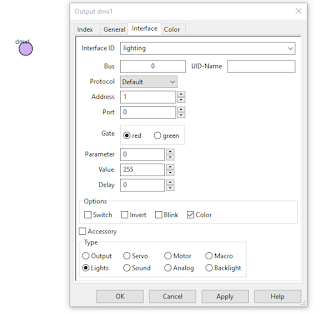 Lamps can be found in ebay at a moderate price, but you also need a PC interface to convert the orders sent by the software normally through the serial port USB to the DMX format. Rocrail is compatible with EuroLite USB-DMX512 Pro converter or DMX4ALL, but you have to order them to Germany and cost 80$ or more. Looks like those interfaces are not sold internationally. 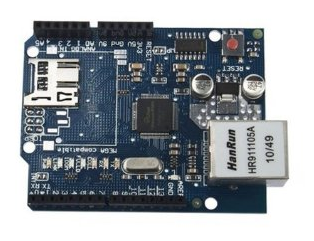 At this point, being the DMX-USB interface the difficult issue, I thought about implementing it myself using an Arduino. And I found DMX shields and libraries, but most of them discontinued or even more expensive than a commercial and complete interface. So my hope went out in smoke again. Last chance, Rocrail is also compatible with an Art-Net node receiver. 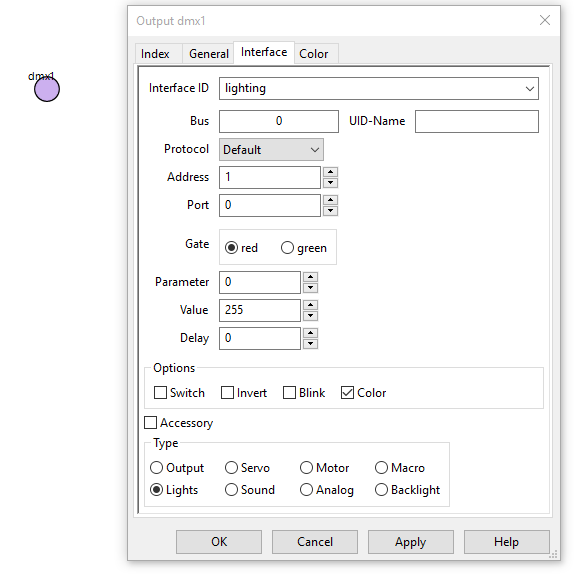 This is a lighting control protocol which appeared after DMX512 to allow connections through LAN or wi-fi networks to DMX systems. Basically it is an encapsulation or transport protocol for DMX based on UDP though a normal computer network. You can read more about it in wikipedia. This system has more or less the same problems than the previous one. 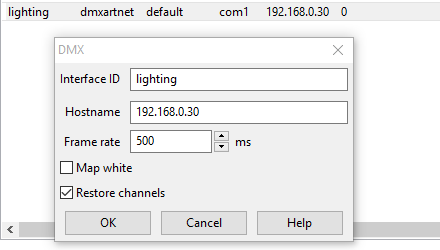 You need an Art-Net receiver, receiving UDP commands (that's the easy part), but again you have to transform this commands to DMX format. 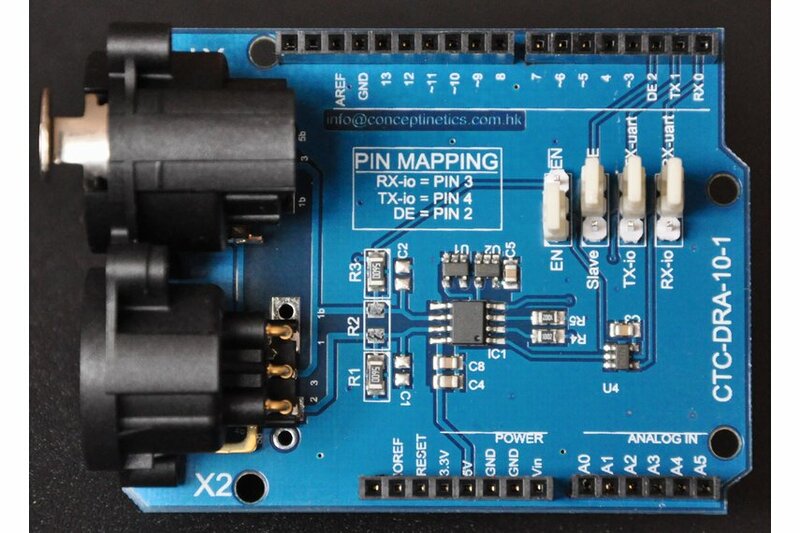 If you want to do it yourself with an Arduino, you need a DMX shield and use DMX lights. 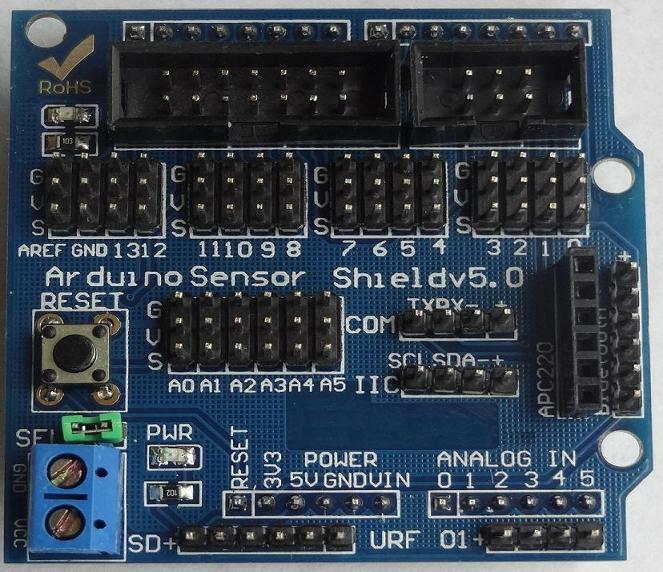 First of all plug the ethernet shield on top of Arduino UNO, and Sensor shield V.5 on top of the Ethernet. 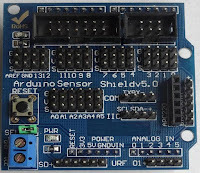 Sensor shield provides and easy way of connecting sensors and breakout boards (like the mosfets boards) to Arduino using cheap Dupont cables that you can also buy in ebay. 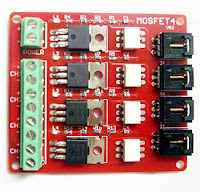 Using Dupont wires (female in both ends) connect outputs 3,5,6 and 9 to the Mosfet board. 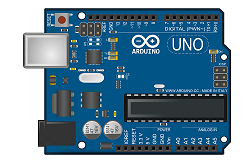 These Arduino outputs are PWM (you can adjust the intensity), and will correspond to channels 1,2,3 and 4 of the ArtNet receiver. 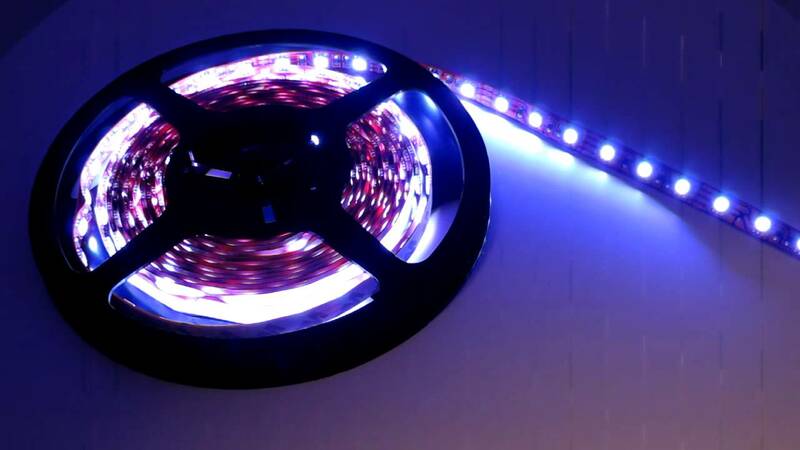 Connect the pure white led strip to one of the mosfets, and red, green and blue channels of the RGB led strip to the other three mosfets through the screw headers. 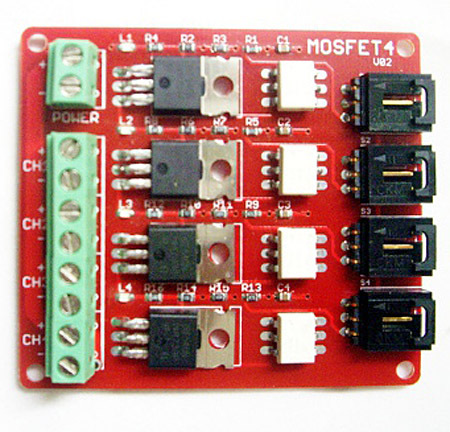 Feed the power of the mosfets board with 12Vcc power source. I use a normal power source from an old computer. 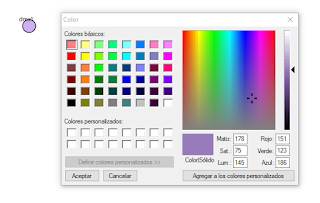 You can download directly my program for the Arduino HERE. It is based on Christoph Guillermet example. By default uses the IP 192.168.0.30, you can change it in the header of the sketch. Well, if you still want to use your system, for sure it will not have a weather functionality and an Art-Net implementation. 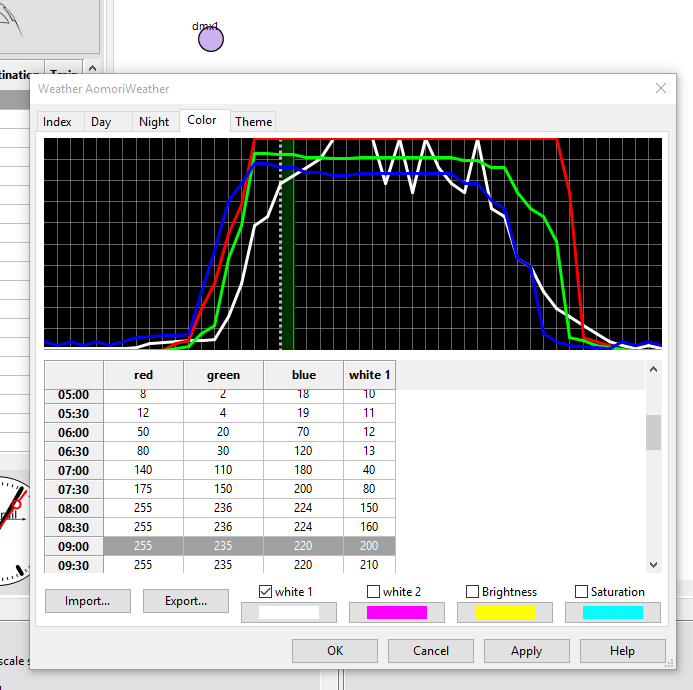 So you can use any freeware Art-Net console in your PC or tablet to adjust your new illumination system. 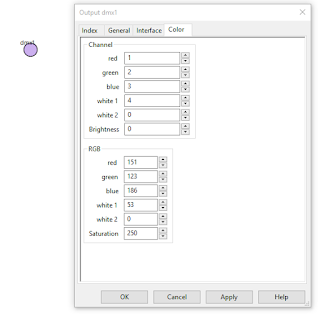 At this point, pressing the output symbol your led strips should glow in the predefined color. 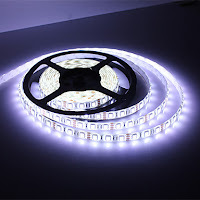 You can create many of them for different ambient lights or an output with strong white to have a good illumination to work on the layout. The basic thing you need here is to define the output (or outputs separated by comma) of your output-light objects to use. In my case I have only one light composed of 4 channels (red,green,blue and white). But you can put some of them ordered from east to west and the software will make light transitions simulating the sun movement. 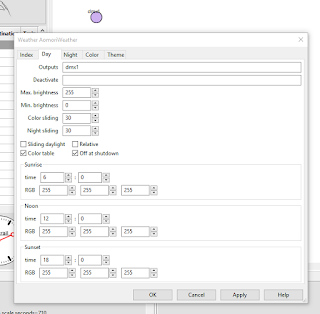 It's possible also to specify different lights for night simulation. You have different options to make it work. 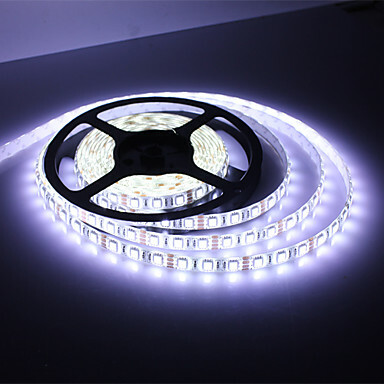 The basic one is to define the time and color for the sunrise, noon and sunset and Rocrail will be calculating the transition according to the time and adjusting your led strip lights. 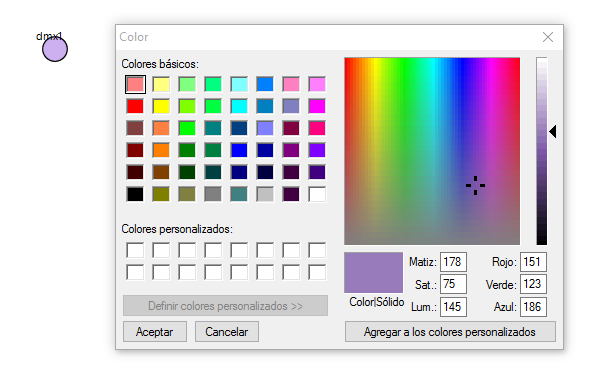 But I prefer to use the color table where you can adjust the exact light during a whole day at 30 minutes steps. Your lights will be adjusted according to the Rocrail clock. If you set up the clock to run faster, lights will also be adjusted at its rhythm. 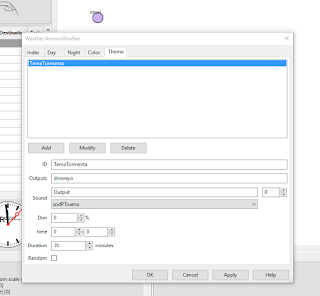 Finally, you can create several Weathers (one for each season, as an example) and an Action to activate or deactivate each of the defined Weathers. 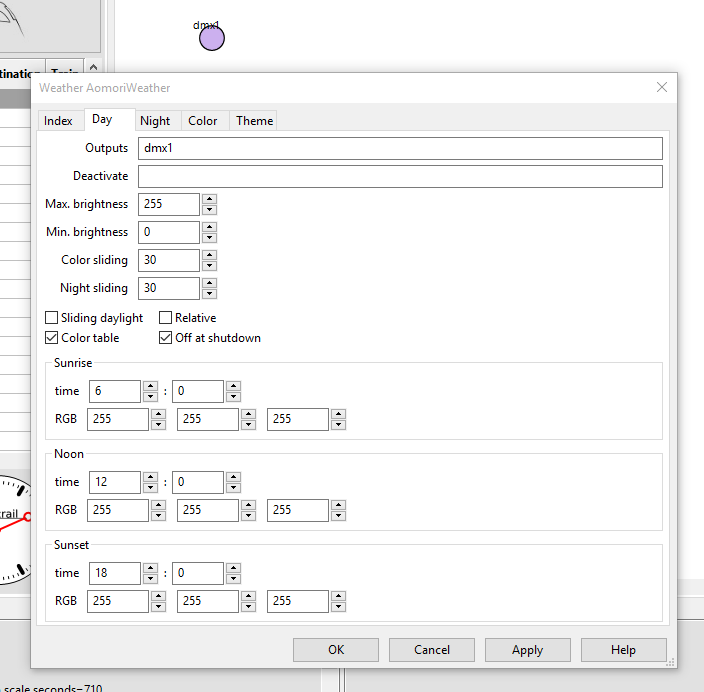 Putting outputs linked to this actions, your lighting system will simulate it. 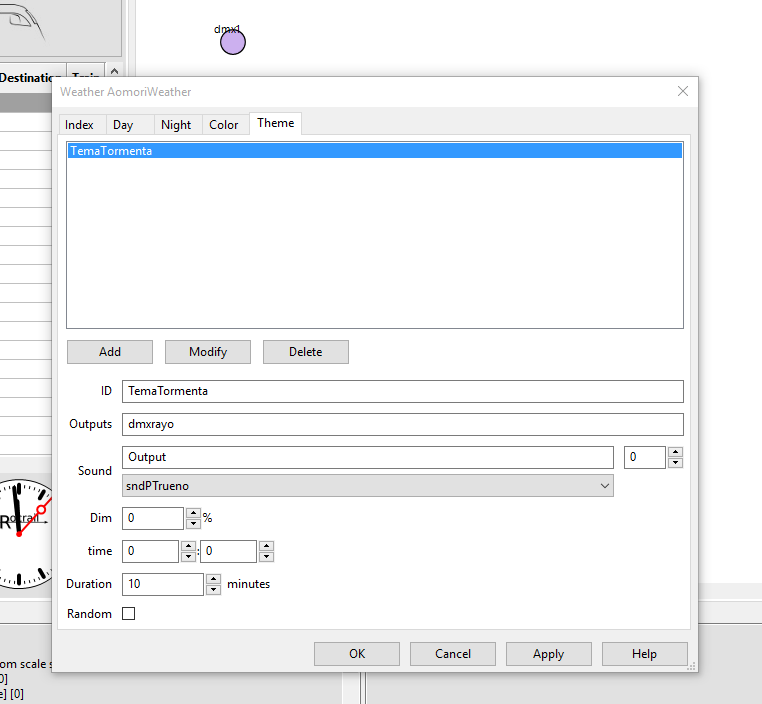 Last but not least, you can create Themes. I use them to define storms, and can be linked to actions and outputs or any layout event to activate them. 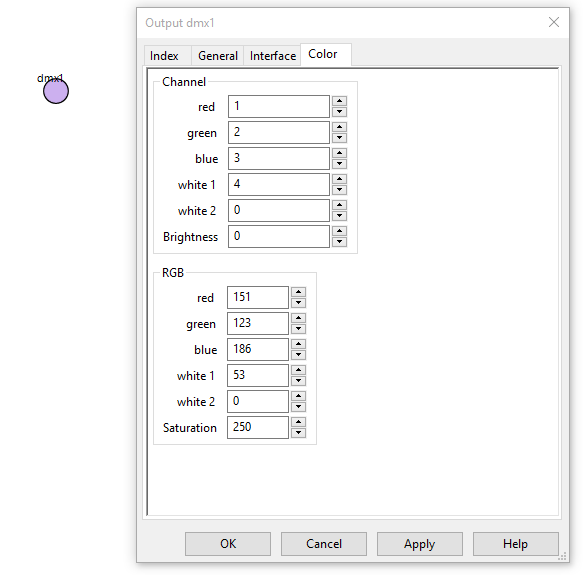 My storm Theme uses another light-output object, but linked to the same white channel of my Arduino Art-net receiver. 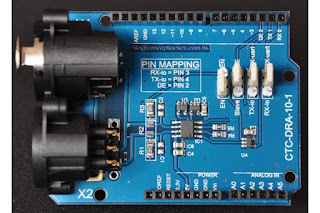 For the thunder sound, I activate the output linked to a storm sound stored in my "Arduino sound and outputs module" that you can also mount following the instructions of this post. 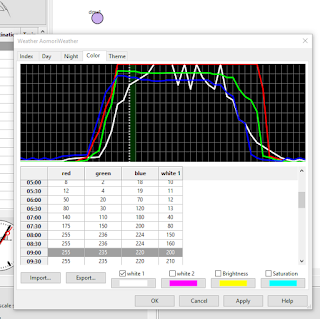 In following post I will try to install RGB Led Flood lamps instead of RGB led strips and several of them to test the sun movement simulation. I will keep you informed!